Sometimes I do some planning before I tie. As I continue my Brammer Binge, I am trying to figure out ways to use color to get some traditional patterns. From top to bottom this pic shows my planning steps to wind up with a Fire Tiger Bunkered Deciever. 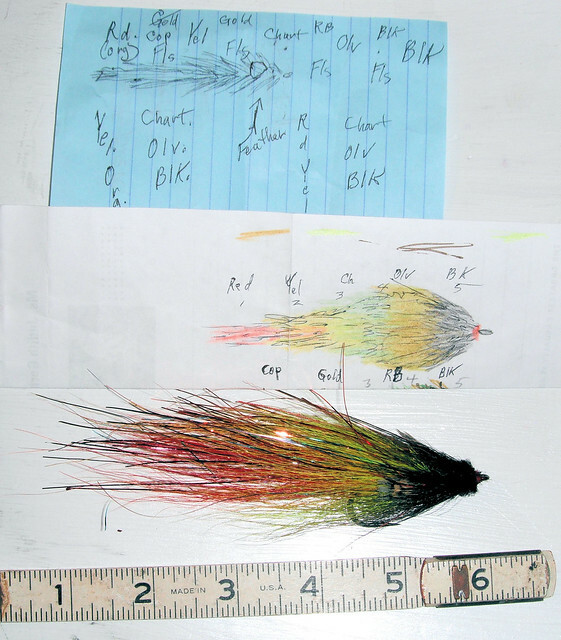 Since the basic model is tied with bucktail flared around the hook shank traditional layering does not work. Switching the layers one on top of the other to one in front of the other seems to work here. I still have some to go in getting the knack for how big a clump of bucktail to use. PS It is a VMC 7250 BLN 2/0. All the great artisans create sketches of their work before hand, which is why I never do. I just start slapping stuff on the hook until I have crowded the eye and say "done"
Sharp looking fly. Never thought of tying a fire tiger fly. I have to admit that the idea for layering back to front came from the Bad Hair Man, Dave Pinczkowski. Successive clumps of white, tan, and olive with a marker for barring created a very real looking baby Smallmouth. Of course you have to use flash and plunk often. But how does he keep from wrapping his own hair into the bug? Now that you mention it, I realize that I never tied a Fire Tiger before either. Since I really like the color combination on lures and have used on swim jigs, I surprised myself here. Are there more streamer patterns in my crankbait collection?